This is an Olde English variant locational name which derives from 'Hans or Hanna's - leah' ie. the farm of Johannes or Johanna, the male and female Saxon forms of John, and introduced into England in the 7th century or earlier. There are a number of variant spellings including Hinsley, Hensley and Hansley, but the original medieval spelling was Hanleye, Hanle, or Hannelaye, the intrusive 'S' being lost before but dialectually re-introduced in some instances in the late Middle English period. Sir John Hanley of Kent appeared at the first medieval tournament at Dunstable in 1308, Margaret Hensley and Robert Hinsley were emigrants to America in April 1846. 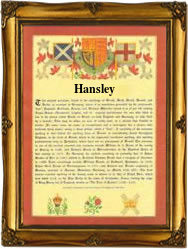 The first recorded spelling of the family name is shown to be that of Tristram de Hanle which was dated 1273, in the Pipe Rolls of Suffolk during the reign of King Edward 1, known as the Hammer of the Scots 1272-1307 Surnames became necessary when governments introduced personal taxation. In England this was known as Poll Tax. Throughout the centuries, surnames in every country have continued to "develop" often leading to astonishing variants of the original spelling.